Announcement Welcome to my Etsy page! I create all these glass items in my studio in West Concord, MA, and also instruct private glass lessons. Prior to working for my own company, I used to work for Simon Pearce Glass Co. in West Chester, PA. I also worked for Corning Museum of Glass in Corning, NY and the Worcester Craft Center in Worcester, MA. Everything is hand made by me and annealed to relieve the stress in the glass. You can check out my website: www.jenngoodale.weebly.com for more information about myself and my work. Welcome to my Etsy page! I create all these glass items in my studio in West Concord, MA, and also instruct private glass lessons. Prior to working for my own company, I used to work for Simon Pearce Glass Co. in West Chester, PA. I also worked for Corning Museum of Glass in Corning, NY and the Worcester Craft Center in Worcester, MA. 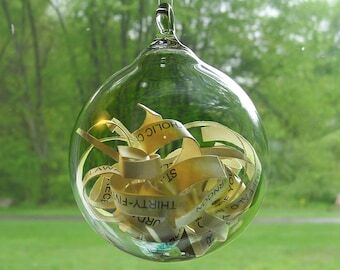 What a lovely blown glass ornament; truly that of an artist. The transaction was, as well, perfect. Creating a miniature glass plate. Attaching birds to watering funnel. Growing up in rural southern New Jersey, I began to show interest in hand building clay from an early age. I used the mud from the banks of a creek that ran through my backyard to shape and mold objects. In 2003 I graduated from West Chester University of Pennsylvania with a concentration in Fine Arts (ceramics). During my last year of college, I started to expand my sculptural approaches by using hot glass. I apprenticed with Simon Pearce Glass Company for several years, learning how to make bar ware, stem ware, vases, candle stick holders, and other glass home decor items. During this time in the factory, I also proceeded to explore Flameworked glass at Salem Community College in New Jersey. Since 2007, I have been exploring glass and clay together; juxtaposing clay and glass techniques into my work. Thank you for browsing my one-of-a-kind glass art pieces in my Etsy shop. I blow and sculpt all glass on my table top torch at approx. 2,000 degrees! I have been working in with glass for 11 years now, and absolutely LOVE it! For more info on my work and bio, please visit www.jenngoodale.weebly.com. If product is broken upon delivery please contact me, applies only for the first week after receiving your order. Refunds are only allowed if item is broken upon arrival. If buyer is sending back order for an exchange PLEASE PACK WELL!! If broken upon return, you will have to reorder with payment. I except paypal and credit card only. **Ship first class, unless package is too heavy. ***NO REFUNDS do to the fact that all orders are made to order. PLEASE READ POLICY BEFORE PURCHASING. First class shipping costs applied till December 13th, then priority shipping applied until December 20th. After the 20th of December, you might be notified for additional shipping costs. I also do corporate gifts, one-of-a-kind sculptures, and wholesale to boutiques and Artisan shops.